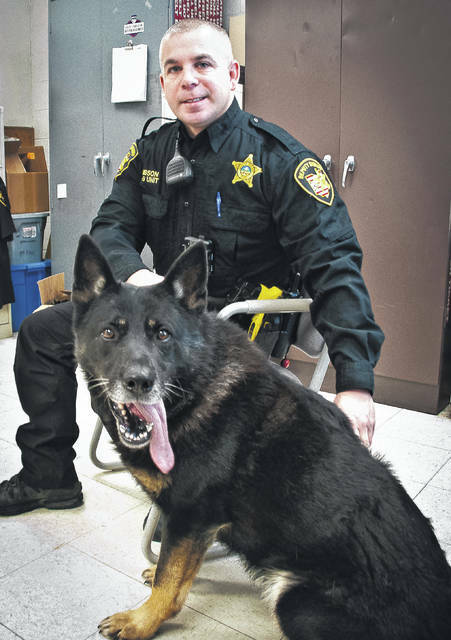 Delaware County Sheriff’s Deputy Troy Gibson said his former partner Deputy Alex is now living a real dog’s life since being retired Dec. 15. Alex was retired for medical reasons due to issues with his hips and spine. Deputy Alex has been a key player in a $100,00 drug bust, searched for missing people, and made multiple public appearances. Now in retirement, he’s ready to live a dog’s life. Alex is a police dog that has served with the Delaware County Sheriff’s Office since 2010, but was officially retired Dec. 15 for medical reasons. Deputy Troy Gibson, Alex’s handler, was given ownership of the dog Dec. 21 by the county commissioners for the cost of $1. Gibson said Alex has moderate hip dysplasia in his right hip and some arthritis in his spine and his knee. Gibson said Alex misses the work because he is still mentally alert and active, but the life of a police dog is a very physical one. Alex’s retirement mostly consists of staying at home, Gibson said. Gibson said he will still use commands for Alex to come, stay, or sit. He said he’ll toss his keys or other objects out into the yard for Alex to search for and retrieve. “That’s his retirement,” he said. Alex’s claim to fame, Gibson said, is that he has metal teeth. He said Alex broke the lower right tooth biting somebody during an apprehension. According to Gibson, Alex’s career highlights include helping to seize $316,000 in drug money and a few other seizures ranging from $10,000 to $30,000, and five physical apprehensions because someone wasn’t listening to deputies or they chose to keep running. During other apprehensions, the people saw Alex and just gave up. Plus thousands of K-9 demonstrations and countless searches for missing people. Gibson said he now has a new canine partner, but Alex doesn’t like the newbie at all. Gibson’s new partner is a Belgian Malinois named Cash. He said Cash is the third dog that he has worked with at the Delaware County Sheriff’s Office. This entry was tagged Alex, delaware county, Gibson, K-9, Sheriff’s Office. Bookmark the permalink.